Haiti, let’s come together as one!, Ayiti, an nou vin fè yon sèl! Èske w’ pare pou CARIFESTA? Men yon videyo ke mikaben, J.Perry, Rutchelle ansanm ak Renette Desir reyalize nan lokazyon an ki pral definitivman ba w’ yon avan gou! Ayiti ap òganize 12yèm edisyon Carifesta ane sa-a. Evènman sila-a se inisyativ ke chèf gouvènman nan Karikòm yo te pran vè lane 1972 nan objektif pou pwomouvwa, nan rejyon an ak entènasyonalman, kilti ak lèza ke peyi Karayib yo genyen lakay yo. Dènye edisyon CARIFESTA-a te fèt nan peyi Sirinam nan lane 2013. Anbasad peyi Lèzetazini nan Pòtoprens fyè pou li anonse ke l’ap sipòte CARIFESTA nan patwone twa atis popilè pou patisipe nan gwo evènman sila-a. Sòti sou jèn chantèz, dansèz, dizayinè Riva NYRI Precil; Elizabeth Blaz, ki fè mask; epi direktè lekòl dans kontanporen ayisyen an Jean Appolon Expressions (JAE). Are you ready for CARIFESTA? Here’s a video clip by Mikaben, J-Perry, Rutchelle and Renette Desir that’ll surely put you in the mood! 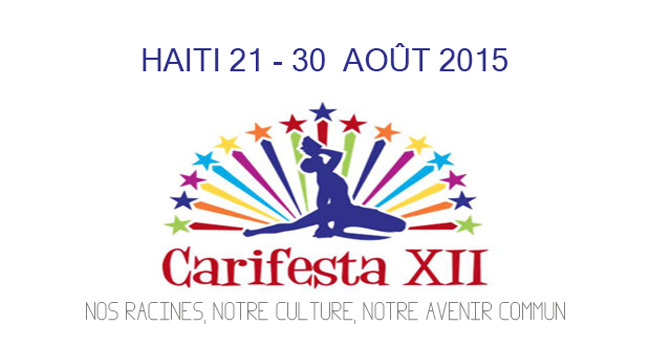 Haiti will host the 12th staging of the Caribbean Festival of Arts (CARIFESTA) this year. This event was initiated by the Heads of Government of the Caribbean Community in 1972 to advance Caribbean culture and arts regionally and internationally. The last one was held in Suriname in 2013. The Embassy of the United States of America in Port-au-Prince is proud to support CARIFESTA with three famous artists. From the young, talented singer, dancer, jewelry designer Riva Nyri Precil; the mask maker, Elizabeth Blaz; to the Haitian contemporary dance company director Jean Appolon.